Lauren Mitchell at the Commonwealth Games in 2014. Photo via WAIS. Lauren Mitchell, the first Australian female gymnast to win a gold medal at the World Championships, was back on the Road to Rio. After dealing with a shoulder injury following the London Olympics, Mitchell went back and forth on continuing on as an elite level gymnast. In 2014, she decided to return to training and just see what happened. And all was going well. Mitchell was named to the team who would compete at the World University Games in Korea, opening today. In a training session on Tuesday night before she was to depart, Mitchell injured her knee. Today, the Western Australian Institute of Sport released an update that confirmed Mitchell has a serious injury. Mitchell has suffered ruptures to both the anterior cruciate (ACL) and posterior cruciate (PCL) ligaments of her right knee. Scans confirmed significant damage to her ACL and PCL and Lauren has been in consultation with her medical and support team in determining the best course of action for her rehabilitation – a process that is still on-going. Lauren wishes to stress that she has yet to make a decision on her gymnastics future and will hold-off on an announcement until after her treatment has been determined. Mitchell took to Instagram today to express her emotions in the situation. An injury of this magnitude usually takes a year to recover from. This makes it next to impossible for Mitchell to make the 2016 Olympics. Though she has not yet made a decision on her future in gymnastics, it is likely that a decision has been made for her regarding the Olympics. It is obvious that she will handle the situation with the class and determination she has always shown. Simone Biles had a historic competition at the 2014 World Championships in Nanning, China. She took home gold medals in the all-around, beam and floor individual events as well as the team gold with her U.S. teammates. Additionally she won the vault silver medal. Biles was the first U.S. woman to win back-to-back World all-around titles in almost twenty years, since Shannon Miller accomplished the feat in 1993-94. She overtook Miller in the most world championship gold medals by winning six in the last two years to Millers five. Biles also became the first U.S. woman to win four gold medals at a single world championships. Biles may very well be one of those once in a life-time gymnasts. She achieved these results by competing some of the hardest gymnastics skills with clean execution (the gymnastics basics: straight legs, pointed toes, correct body positions and stuck landings). And she did it with so much energy and power, it is easy to see that she has a lot of room to do even more. While most gymnasts look to be at the very edge of their abilities, Biles soars through the air with room and energy to spare. Biles will resume full time training, with a slower pace and some time to work on new skills.”I am taking training a little bit easier right now and will learn a few new skills on a few events” said Biles in a media phone interview. Though she may not really need to continue adding to her difficulty score (she led the all-around competition in difficulty) she has not yet reached her limits by any stretch of the imagination. In fact, her shoulder injury earlier in the year caused her to have to downgrade bars from last year. After the world championships, coach Aimee Boorman mentioned in a tweet that now that her shoulder is healed, Biles will be looking to upgrade her second vault to a Cheng. In the interview this morning, Biles confirmed that she will be working toward the Cheng. She also shared that since her Amanar vault is so consistent, Marta Karolyi has encouraged her to try for the triple-twisting yurchenko. If successful, Biles would be the first woman in history to compete this vault. As for other upgrades, Biles said she would also be looking to get bars back to her former level of difficulty by adding the shaposh half back in. She said she also might work the double-double layout on floor, a pass competed by only three other female gymnasts on the international elite level. And though she had phenomenal success this year, she was only able to hit beam like she does in training in event finals. Biles said she plans on addressing that in her training plan as well. After leaving her longtime gym earlier in the year with Boorman, Biles trained for a while at another local gym. Now, they are training in a temporary location while the gym that her parents are building is completed. It is supposed to be completed in May or June of next year. For now, she is content to be training somewhere they can call World Champions Centre. “In the beginning they kept telling me they were going to start building [and it wouldn’t happen]… but I am busy training. I don’t really pay attention to the details, it’s not my business.” Running a gym is not something she sees in her future, and is something she is happy to leave to her parents. What she does see in her future is college gymnastics. Earlier this year, Biles committed to UCLA, and she is firmly committed to maintaining her NCAA eligibility. Though she will put all of her energy and training into shooting for the 2016 Olympics, she currently does not have plans to go pro. “My parents have talked about it a little bit but haven’t pushed me. They are letting it be my decision.” Biles acknowledged that things might change in the future, but for now that is her direction. With Biles’ power, energy, determination and team of supporters, it seems that for her the sky is the limit. Literally. Earlier this week, Peyton Ernst of Texas Dreams quietly withdrew from the 2014 P&G Senior U.S. National Championships. Gymnastike interviewed coach Kim Zmeskal Burdette to get an update on the situation. According to Burdette, Ernst had dislocated her shoulder doing a vault early in July. She had not had any problems with her shoulder previously. They worked to correct the problem and hoped for the best, but it happened again Monday, August 10th. Surgery became inevitable and will take her out the rest of the season. “Peytons [injury] has been the hardest one. She has been in such a good place, taking things step by step to try to make this world team,” shared Burdette. She went on in the interview to share about her disappointment for Ernst as she had finally began to believe in her ability to make the world team. Ernst was a strong contender to make last year’s world championship team, but just fell short of the mark. She is a strong all-around gymnast, but stands out on beam and bars. Ernst was most definitely a strong contender for this year’s worlds team as she is likely to contribute a strong score to the team on those two events, has the potential to make a beam final, and is strong enough in the all-around that she can compete on any event if needed. Ernst was nursing a sore ankle back in April when she received the call to jump on a plane early the next morning to fly from Texas to Vancouver, BC. She came to take the place of Simone Biles at the Pacific Rim Gymnastics Championships. Ernst rose to the occasion and put in a stellar performance with very little prep time. However, when she returned home, it turned out that she had been competing with a hairline fracture in her foot. Ernst rested the foot, and then returned to training. When Ernst did not compete in the Secret U.S. Classics earlier this month, the plan was still for her to compete at nationals. However, the recent shoulder injury has put Ernst’s dreams of Worlds on hold for another year. 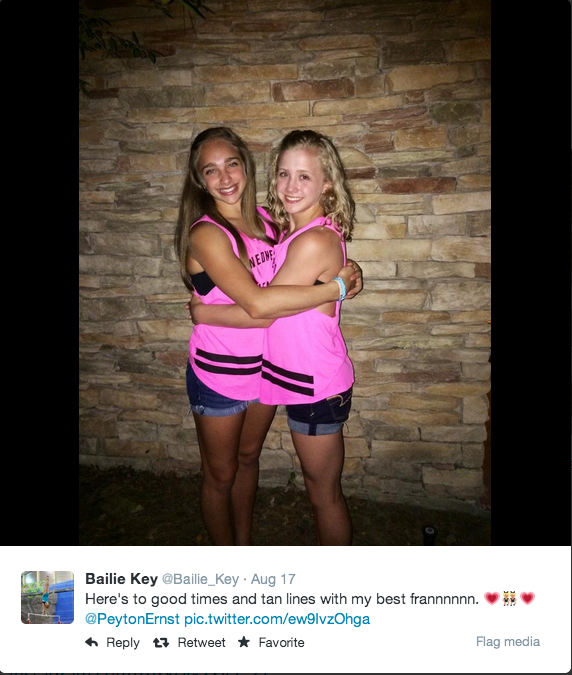 Ernst’s teammate Bailie Key, who is also out with an injury tweeted a picture of the two of them, with plans for “good times and tan lines” on Sunday. It appears the two are taking their injuries in stride and making the best of their forced time off. The shining star that was Rachel Gowey at the Secret U.S. Classics two weeks ago has unexpectedly fizzled out. Gowey, one of the latestest proteges of Liang Chow, coach of Shawn Johnson and Gabby Douglas, put in an unexpected performance at the Classics earlier in the month. Her difficult skills and exquisite lines launched her from up-and-comer to full out player for a spot on the 2014 World Championship team. Since then, she has been on of the most anticipated performances at the P&G U.S. National Championships. Today in training, she landed just a little short on her beam dismount and fractured her ankle. She had been performing well on beam in practice and her difficult dismount looked like it was all the way around. But she didn’t quite make it to her feet, bounced forward and fell to her knees. She didn’t get up until coach Chow carried her off the mat. The beam footage is in the bottom left feed of the video. The timing of this injury is so unfortunate as Gowey will not only miss her senior debut at the national championships, but will undoubtedly be out for the rest of the year, missing the Pan American Championships and the World Championships. What is even more heartbreaking for the 16 year old is that Gowey was out all last year with a back injury, making this two years in a row that injury prevented her from showing the world what she can do. The Junior National All-Around Title seemed to be as locked up as the senior title in this year’s upcoming P&G US National Championships. Since the start of 2013, Bailie Key has won every junior all-around competition she has competed in. Eight all-around titles, seven on international soil. Her current scores put her right in the mix with the senior all-around podium. And no junior competing this year looked to have a chance to catch her. Throughout the past couple weeks, it has been challenging to settle on our decision. But in the end, with the 100% undeviating advice and support of those we trust and respect the most, together with Bailie, we decided it best that she forego this year’s Championships. Letting her safety along with “big picture” goals guide us, it became an obvious decision, although not an easy one. While sitting out of a competition is always hard for a gymnast, this is just a small bump in the road. Next year, the celebrated junior becomes a senior where her real challenges begin. Texas Dreams, we join with you in celebrating Key’s incredible junior career and looking forward to her senior debut. Let’s take a moment to watch her beautiful, mature new floor routine for 2014. In the meantime, the junior national title is still up for grabs in this all important year for these juniors. All but one of the Fierce Five were still juniors in 2010, the same point in the Olympic cycle that we are at now. Aly Raisman was a first year senior, and took third in the senior division that year. Jordyn Wieber, like Key, had to sit out due to injury. The other three Fierce Five members were in the top four of that competition. Kyla Ross won her second consecutive junior national title, McKayla Maroney finished third and Gabby Douglas came in fourth. Not that a finish on the junior podium this year would guarantee a spot on the 2016 Olympic Team, but it is an incredibly important step for many of these juniors that are seeking to position themselves well. With the top three from 2013 out of this year;s junior competition (Laurie Hernandez, silver medalist is also out with injury and Amelia Hundley, bronze medalist, is now a senior), the door truly is wide open. The senior year that just never arrives has been postponed once again. Lexie Priessman has scratched the 2014 Secret US Classics due to an injury. A star during her junior years, Priessman was fully expected to be one of the top US seniors in 2013. However, an achilles injury during training at the US National Championships and then a somewhat unrelated surgery kept her out of competition for the year. Recently Priessman left her lifelong coach Mary Lee Tracy and training partner Amelia Hundley to train at Precision Gymnastics, citing the need for a change. Between the injuries and coaching changes, fans anxiously awaited Priessman’s appearance at the 2014 Secret US Classics. Priessman had a great podium training Friday morning. However, during a closed training session on Friday evening she was injured. The Gymternet reported that she injured herself on a beam dismount and was taken to the hospital. The extent and nature of the injury are not yet known. Update: According to a brief conversation with Tripletwist, Priessman tore a ligament that attaches to her fibula and has to have surgery. Here are some of her training highlights from podium training. It would seem that Gabby Douglas has settled in to train at Buckeye Gymnastics in Powell, Ohio in her bid to defend her Olympic title at the 2016 Olympics. With the recent coaching changes, Douglas has pushed back her timeline to return to competition and will not compete in the P&G National Championships later this month. Nor will she petition to the World Team selection camp this fall, focusing on 2015 instead. In addition to regaining her former skills, Douglas will need to update her routines and combinations to be consistent with the new Code of Points, which changes after each Olympics. And in order to be competitive, she will need to continue to increase her difficulty (start) values. Carpenter said she wants to add new skills on uneven bars and floor exercise to boost her start values. With so many people in her court rooting for her success, hopefully moving on and achieving her dreams of Rio is exactly what she will do. Exactly two years ago, five young girls made history at the 2012 Olympics. It is hard for any gymnastics fan not to get choked up thinking of that night. And if you are just tuning back into the gymnastics world for the upcoming elite competitions, then undoubtedly the status of each of the Fierce Five gymnasts is on your mind. Coming off of the 2012 Olympics, each gymnast expressed their desire to continue in the sport of gymnastics and make a run at the 2016 Olympics in Rio de Janeiro. And so, the question constantly remains – when are they returning? Kyla Ross, the youngest member of the Fierce Five has not missed a beat since the 2012 Olympics. She has competed at nearly every major competition since then, and is undeniably one of the USA’s shining stars. Ross is expected to headline both the Secret US Classics and the P&G National Championships this August. She looked great in podium training and well prepared for the season. McKayla Maroney has also continued to train towards Rio despite four, count them four, leg surgeries since the games. Shortly after successfully defending her World Championship Vault title last year, Maroney took a rest from gymnastics to heal up some knee issues. After having some knee pain at Worlds, she discovered she had tendonitis in one knee and a fracture in the other. Unfortunately rest was not enough and she finally underwent surgery in March. Maroney had six to eight weeks of therapy following surgery, and was released to return to training in late May or early June. She assured people in an interview with International Gymnastics (AWESOME interview that you have to watch!) that she will be working hard to be back for P&G National Championships and World Championships this year. However, she has yet to return to a national team training camp and has not yet released any information about her competition status. Update: In a social media video she made today, Maroney said that she would not be competing this season.“I just want to say how much I appreciate you guys following me, supporting me, being there for me even though I can’t compete this season with my injuries.” She also gave a great interview to USA Gymnastics catching us up on the details of her injuries and her commitment to Rio. Gabby Douglas made her serious return to training this spring with a return to her former gym in April. After her trial period with coach Chow was over however, she decided that this was not the best training option for her and has set out to find a new gym to make her bid to Rio. She is currently training at Buckeye Gymnastics, however it is not known if she will stay there long-term. Douglas impressed Marta Karolyi at the June National Team Training camp with her level of physical fitness, however Karolyi was hoping to see her compete at the Secret U.S. Classics and the P&G National Championships to help determine if she would be ready to compete at this year’s World Championships according to an interview with NBC Olympic Talk. Douglas is not competing this weekend at Classics, though it has not yet been announced if she will be competing at the national championships later this month. Update: New coach Kittia Carpenter of Buckeye gymnastics confirmed that Douglas will not be attempting to comeback to competition until 2015. Check out the full story here. Aly Raisman announced earlier this year that she would be pacing her comeback slowly and focusing on attending her first national team training camp after the World Championships in October. A few videos have come out as well as an interview here and there that indicates she is training seriously and working hard, just pacing her return to competition. She will be focusing on 2015. Jordyn Wieber is the one member of the Fierce Five who has not yet resumed training at the elite competitive level. From all appearances, she thoroughly enjoyed taking a year off from gymnastics and any heavy training to attend her first year of college and be team manager for UCLA gymnastics. Though Wieber has maintained that she is working to stay in shape, she has yet to announce a decision about a serious return to competitive gymnastics. She maintained for the last year that she wanted to try a year of college and then decide what to do. As we are coming up to the start of a new school year, it seems that her decision should be coming soon. In the current regime of USA Gymnastics, the likelihood of most of these incredible gymnasts being able to represent the USA at two Olympics is slim. The nature of the sport combined with the incredibly successful system that is currently in place makes it difficult for the older gymnasts to compete with the young fresh talent coming up. However, if anyone can do it, the Fierce Five can. With two years to go, there is still time for each of them. Though with the realities of gymnastics, the ticking of the clock is always a loud sound. Agrapides took the junior ranks by storm last year with what is undeniably the best vaulting in the junior ranks. With a great deal of promise on all the events, and many years to go in her career (she just misses the age limit for the 2016 Olympics) the future is very bright. It will be great to see her seek to defend her vault title at the end of the month! From all appearances, Key is ready to go and this is just a minor blip in her year. As she is already qualified to the P&G National Championships, and has competed twice this year internationally, missing this competition really isn’t a big deal. Most likely, Key would have liked to have a warm up meet before defending her title at nationals, but coming in fresh and healthy will benefit her more in the long run. Key rose slowly in the junior ranks until last year, where she became the dominant US Junior. Not only is Key the current Junior National Champion in the US, she has won every international competition she has been in both in 2013 and in 2014. Unless any of the current juniors come out with a surprise performance this year, that is unlikely to change any time soon. Key’s sweet smile, dependable performance, and beautiful gymnastics will be missed at Classics this year. But it will give other juniors time to shine. And will lead us to appreciate her even more at the P&G National Championships. Here is Key at the 2014 Pacific Rims. Her new floor routine is one of my very favorites this year! And here she is at the May National Training Camp. She trains a double layout here, which would be a new addition to her floor routine if she puts it in this year. Thanks To Ruth Judson for the great photos. Check out her work!